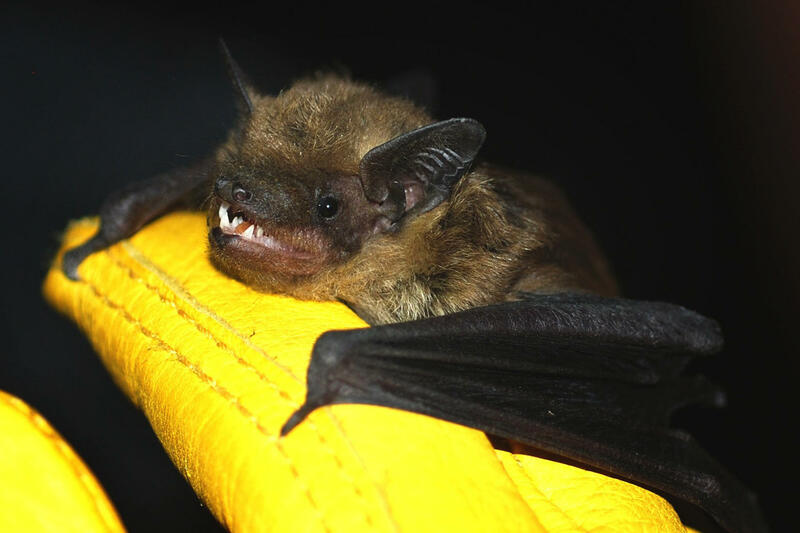 Big brown bats like this one are relatively common in urban areas, sometimes roosting in buildings. Contrary to popular belief, bats rarely carry rabies and are not rodents. They belong to the order Chiroptera, which means "hand-wing." Vona Kuczynska checks the wing of a big brown bat for spots, holes or tears. Any damage could be a sign of white nose syndrome, a fungal disease that has killed more than 5.5 million bats in the Eastern U.S. and Canada. Bellefontaine cemetery was founded in 1849 as part of the rural cemetery movement. It is now a certified arboretum, with more than 5,000 trees planted across 314 acres. 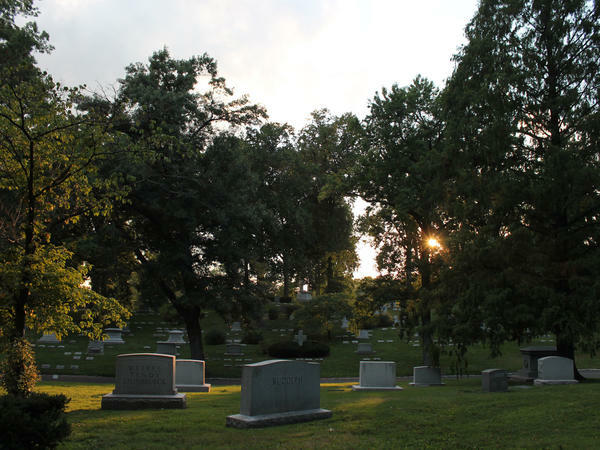 Many notable St. Louisans are buried here, including explorer William Clark, author William S. Burroughs and Adolphus Busch, co-founder of Anheuser-Busch. I've visited St. Louis' Bellefontaine cemetery before, but never at night. It's really dark. The looming trees are black against the sky, where a half-moon is just barely visible behind some clouds. I can see eerie lights and strange, shadowy figures moving among the gravestones. As I move in for a closer look, one of the figures turns in my direction: "Hi, my name is Vona Kuczynska, and I'm a wildlife biologist and a student at the University of Missouri, St. Louis." OK, so the mysterious lights are just headlamps. And what look like ghosts, or maybe zombies, are researchers — looking not for the dead, but for the living. Turns out all this nighttime activity is part of a larger effort to get an idea of the range of wildlife in the cemetery. Scientists have already studied birds at Bellefontaine. On the night I visit, some people are looking at moths. Kuczynska is focusing on bats. 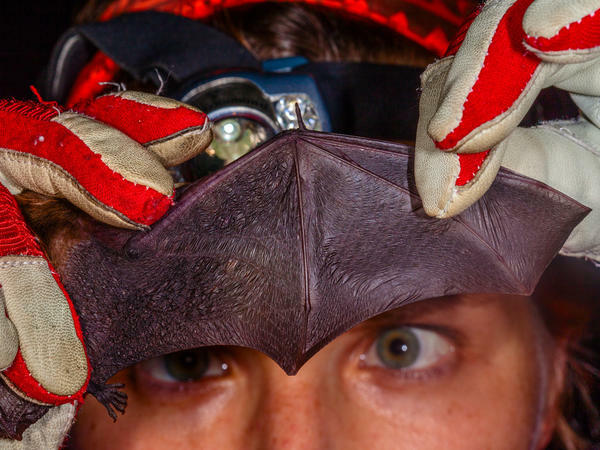 "When you're holding a bat in your hand," she says, "you just see how beautiful they are. And they have so much personality." "Bats absolutely have personalities," Kuczynska insists. Some species are really gentle, she says, and don't seem to mind being handled. "Whereas other bats — usually the bigger bats — are way more aggressive, and they'll try to bite you, and escape, and do all these things," Kuczynska says. Kuczynska got to Bellefontaine before sunset, along with some other students, volunteers and wildlife specialists from Missouri's department of conservation. They helped her set up four big nets — something like oversized volleyball nets, only with much finer mesh. Biologists use the nets to catch birds, but Kuczynska says they can trap bats, too. Still, over the course of the evening, the researchers manage to snag only three: an eastern red bat and two big brown bats. The elusive bats have a kind of biological sonar, called echolocation, that helps them avoid obstacles like nets — and find their insect prey — even in total darkness. So to figure out which species of bat live in the cemetery, Kuczynska also uses a special bat detector called an AnaBat. To show me how it works, Kuczynska carries one of the big brown bats they caught over to the device. It doesn't look like much. It's about the size and shape of a paperback book, lying in the middle of one of the cemetery's winding paths. But as Kuczynska approaches, holding the bat, the AnaBat starts clicking like crazy. "The bat is making a lot of noises that we can't hear," Kuczynska says. "They're not in the audible range. So the AnaBat is recording the noises and playing them back to us in a range that we can hear. And it allows us to see if there's ... bat activity in the area." The next day, Kuczynska analyzes the AnaBat's readouts to see which species had been flying overhead. She says it's not possible to tell individual bats apart, but she counts 58 calls, split about evenly between eastern red bats and big brown bats. Seth Magle, who directs the Urban Wildlife Institute in Chicago, suspects that most of the species found in cities are using cemeteries as habitat, or to forage for food. But cemeteries aren't just great places for spooky things like bats. Like parks, golf courses and other urban green spaces, cemeteries can provide a refuge for all sorts of wildlife, including red foxes, skunks, woodchucks, opossums, white-tailed deer and beaver, Magle says, as well as fox squirrels, gray squirrels and "all the sort of usual urban residents that you would expect — rats and house mice and things of that nature." It's easy to understand why animals would be drawn to a cemetery like Bellefontaine — it's like a majestic, 19th century park, with thousands of big trees spread out over more than 300 acres. But Magle says even a cemetery that's just grass and gravestones could have some value for wildlife. "Species like coyotes, at least around here, are not terribly selective," Magle says. "Seems like mostly what they're looking for in these urban areas are rabbits, and rabbits like grass. So the rabbits will come in for the grass, and then the coyotes may come in for the rabbits." The idea of cemeteries as wildlife habitat may seem strange in America, with its mostly manicured grave sites. But it is common practice in England to let at least the older parts of cemeteries return to a more natural state. Mandy Elford works as an ecologist for the government of Manchester, a city that's actively trying to make its cemeteries more wildlife-friendly. "Nobody wants to go to an overgrown grave for a loved one," Elford says. "But we can have little messy places here and there." With urban development and industrial agriculture, animals have to live somewhere, Elford says. Why not cemeteries? How might the dead feel about having all this wildlife running around their graves? Elford laughs and says she doesn't think they'd mind one little bit: "Personally, I would be very happy." We're going to spend a little time now in a cemetery in the interest of science. Veronique LaCapra of St. Louis Public Radio mustered up her courage and went out to the cemetery at night. VERONIQUE LACAPRA, BYLINE: I had visited St. Louis's Bellefontaine Cemetery before, but never at night. It is dark. There's just about a half a moon visible in the sky and - wait a minute. What's that over there? I can see eerie lights and strange, shadowy figures moving among the grave stones. UNIDENTIFIED ACTOR: (As character) Look. There comes one of them now. VONA KUCZYNSKA: Hi, my name is Vona Kuczynska, and I'm a wildlife biologist. And I'm a student at the University of Missouri St. Louis. LACAPRA: OK. Those mysterious lights? - headlamps. And the ghosts or zombies? - just researchers. They're part of an effort to try to get an idea of the range of wildlife that's in the cemetery. Scientists have already studied birds here. Tonight, some people are looking at moths. Kuczynska is focusing on bats. KUCZYNSKA: When you're holding a bat in your hand, you just see how beautiful they are. And they have so much personality. LACAPRA: What do you mean? Wait, wait, wait, wait. So bats have personalities? KUCZYNSKA: Bats absolutely have personalities. LACAPRA: Some species, she tells me, are really gentle and don't seem to mind being handled. KUCZYNSKA: Whereas other bats - usually bigger bats - are way more aggressive. And they'll try to bite you and escape and do all these things. LACAPRA: Kuczynska's in the cemetery trying to find out what kinds of bats are flying around here. LACAPRA: That's a big brown bat complaining about getting snagged in one of the nets Kuczynska and her helpers set up before sunset. They look something like oversized volleyball nets, only with much finer mesh. But very few bats actually get caught in them. That's because bats use a kind of biological sonar called echolocation to avoid obstacles and find their insect prey, even in the dark. So Kuczynska is also using a special bat detector. LACAPRA: To show me how it works, she carries the big brown bat toward a small device that's lying on the ground. It's about the size and shape of a paperback book. It's called an AnaBat. KUCZYNSKA: And so the AnaBat is recording these noises and playing them back to us in a range that we can hear. And it allows us to see if there's activity - bat activity - in the area. LACAPRA: Now, it turns out that cemeteries aren't just great places for spooky things like bats. SETH MAGLE: I mean, I suspect that most of the species that are found in cities are probably also using cemeteries. LACAPRA: Seth Magle, who directs the Urban Wildlife Institute in Chicago, says with increasing urbanization, it's critical that animals have places in cities where they can live. He says like parks, golf courses and other urban green spaces, cemeteries can also provide an essential refuge for all sorts of wildlife. LACAPRA: Along with more common city residents, like birds and squirrels. It's easy to see why animals would be drawn to a cemetery like Bellefontaine. It's more of a majestic, 19th century park, with thousands of big trees spread out over more than 300 acres. But Magle says some animals can forge even in a place that's just gravestones and grass. MAGLE: Species like coyotes are not terribly selective about that kind of stuff. It seems like mostly what they're looking for in these urban areas are rabbits. And rabbits like grass, so the rabbits will come in for the grass and then the coyotes may come in for the rabbits. LACAPRA: The idea of cemeteries as wildlife habitat may seem kind of strange here in America, where most cemeteries are kept pretty manicured. But over in England, where, like in the U.S., urban development and industrial agriculture have reduced wildlife habitat, it's common practice to let at least the older parts of cemeteries go back to a more natural state. MANDY ELFORD: Nobody wants to go to an overgrown grave for a loved one. But we can have little nesting places here and there. LACAPRA: Mandy Elford works as an ecologist for the city of Manchester, which is actively trying to make it's cemeteries more wildlife friendly. How do you think the dead would feel about having all this wildlife running around their graves? ELFORD: I don't think they'll mind one little bit. (Laughter). LACAPRA: Personally, Elford says, she'd be very happy about it. For NPR News, I'm Veronique LaCapra.